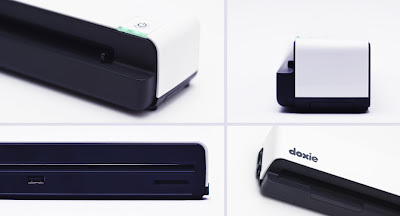 Doxie has added another portable scanner to its heart-logo'd lineup, the Doxie One, which can digitize documents and images to an included SD-card with nary a computer in sight. 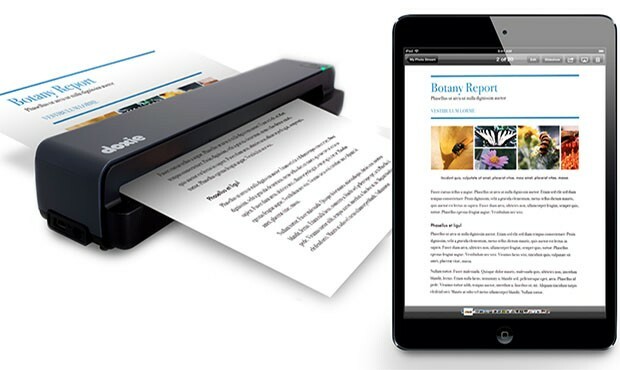 Doxie says that'll let you travel light with the "paper-towel roll sized" device to scan and automatically generate Abbyy OCR-read PDFs, then sync up later with a Mac, PC, iPhone or iPad. Doxie One may look like a cut-down version of Doxie Go at first but it’s hard to comment without reviewing it completely. I see Doxie One as going for a different direction as Doxie Go. It’s still portable and wireless, but this time, it does not have a rechargeable battery and built-in memory. Though that may seem bad at first, it is not. Doxie One can be powered by wall power or with AAA batteries. This means Doxie One is much easier to use if you are always running around in different places (as you can carry AAA batteries with you as an “unlimited” supply of power). When you are near a power supply, you can just plug it directly to a wall socket. Without a built-in memory, it simplifies the workflow process as you can use the SD card or directly sync the scanned documents to your computer, wireless. Doxie One can sync to your PC or Mac. However, if you don’t have them (for any reason – maybe you are traveling with your tablet), you can directly scan and sync it to your tablet (such as an iPad). Or you can sync your documents to the Cloud applications/services such as Evernote. Should you want a traditional approach, you can always store your scanned documents into an SD Card (a 2GB SD Card is included with the purchase of Doxie One) and use a card reader to grab them. The gadget measures 10.5" x 1.7" x 2.2" (26.7 cm x 4.35 cm x 5.6 cm) and weights 14.2 oz (403g). It features arechargeable lithium-ion battery that on full charge can consume 100 documents. The speed of scan is 8 seconds per full-color page, which is not very fast but still impressive considering that it's a portable scanner.